You might have tried Coco-cola. But ever tried to cook anything with it? 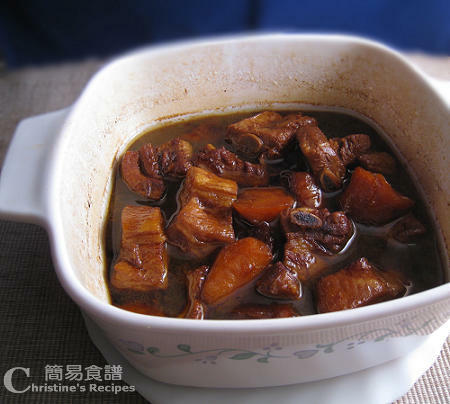 Here’s a very delicious and popular Chinese dish, using Coco-cola to cook sauce with pork ribs. The Coco-cola penetrates pork ribs and make the texture of them so tender. You won’t taste the original and special taste of Coco-cola anyway. If you are a fan of Coco-cola, like my daughter, get a cup of coco-cola to go with this dish. Is it a good idea? Cut pork ribs into chunks. Blanch in boiling water for 2 minutes to get rib of any blood and fat. Drain well. Heat 2 tablespoons of oil in wok, sauté ginger and spring onion until aromatic. Add pork ribs, sauté and continue to cook until lightly brown. Pour in the seasonings, mix well. Transfer all ingredients to a clay pot or a medium pot. Add coca-cola and water. Cover and bring it to a boil. Lower the heat and simmer for 45 minutes. Add carrots, simmer for another 20 minutes until sauce thickens. If the sauce is left too much and not thick enough, then swift to higher heat. As the sauce gets lesser and thickens, it’s much more tasteful. Remember to taste by yourself while cooking in this step. If you’re satisfied, it’s done. You can use chicken or chicken wings instead of pork ribs if you like. That needs shorter cooking time though. Please note that you won't taste any flavour of Coco-cola as the same as you drink from the bottle/can because the flavour would be boiled away after long cooking process. But the coco-cola can help tenderize the meat, nearly fell-off the bones. OMG, this is my favourite dish, looks so yum! i've never tried using coke on my dish before. but that makes sense, because if we add sugar, might as well add the cola, huh? this looks soo good....yum! Yeah, you're right. In this recipe, we don't need to add any sugar. Haha, Christine, I guess the idea of using coke to make savoury dishes is created by Hong Kong people. Just by looking at the dish, it makes u feel like home, esp when you're living overseas now, right? I like my mom's Chicken Wings with Coca-cola and potatoes. Yummilicious! This looks awesome. People often use coke in Korean BBQ marinade.. I plan on making this dish soon! Thanks for sharing. Well, this sounds fantastic. I'm going to try to put my ham in a bag and cover it with a can of coke this Easter Sunday. And after that, I'll try this recipe. I guess it makes sense that it would be a great sweet flavoring for savory meats.